Studio Capture is the proverbial dark horse, with massive I/O and serious audio quality. LOTS of I/O. Set-up configurable from front panel. Four independent Monitor Mixes. Roland might not be the first name that springs to mind when you think of companies that build audio interfaces, yet its Capture range has proved popular. With higher quality audio conversion than some might have predicted, alongside a range of other features designed for ease of use, it's no exaggeration to say that some heads have been turned. 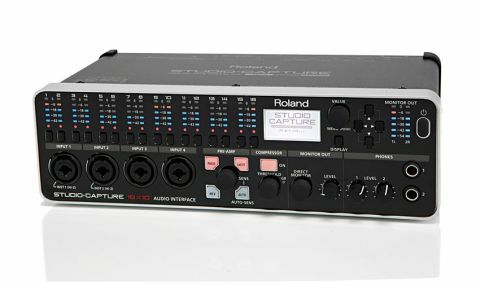 Still, the release of the new Studio Capture is quite a bold move, as it represents Roland's flagship audio interface in this range, with a price tag to match. Is Roland ready to make the step into the premier league of audio interfacing companies? Well, if your primary consideration when buying an audio interface is lots of I/O, the answer has to be a resounding 'yes'. Studio Capture boasts an impressive 18 input/10 output configuration, despite its unusual design, which sits somewhere around three-quarters of a rack unit wide and 2U deep. Fortunately, it's supplied with 'ears' for those intending to rackmount the unit, but despite its relatively compact frame, Studio Capture is awash with ports, meters and dials. The front panel gives you access to combi microphone/ line input ports for the first four channels, whilst a further eight of these lie in wait on the rear panel. Inputs 13/14 and 15/16 are stereo line level inputs and these also reside around the back, alongside SPDIF In/Out ports, MIDI In/Out and the USB connector. "You can enable phantom power for each channel, invert phase, employ a low-pass filter and even switch on Roland's onboard compressor on a per-channel basis"
We're still not done, as Studio Capture boasts eight independent outputs, alongside main XLR Monitor Outs. Oh, did we forget the power input port? There's just about room for that too. Despite the space lost to connections, the upper half of the front panel keeps you up to date with levels, via a neat configuration system for each input. To set up levels for a channel, press its selection button, then use the assortment of options for it; you can dial in your own amount of gain, or use Roland's auto-sensing onboard software to do this automatically, for starters. Then, you can enable phantom power for each channel, invert phase, employ a low-pass filter and even switch on Roland's onboard compressor on a per-channel basis, which provides a full complement of parameters to allow for great-sounding results. Of course, compression can be used simply to dynamically control monitoring of recordings as they're made and Studio Capture is well stocked in this department too, with twin headphone ports on the front panel and the capability to create up to four independent monitor mixes from the unit itself. "How is it in the heat of a session? Very solid indeed"
What's immediately clear is that Studio Capture has the I/O capabilities to handle a complete recording session without the need for re-patching (although if your input demands are particularly high, two Studio Captures can be chained together) but how is it in the heat of a session? Very solid indeed. Configuring inputs from the front panel works very well (and is in contrast to some rival interfaces which handle such tasks exclusively over software) whilst the visual feedback from the LED ladders and the LCD screen is thoughtfully designed and intuitive. Most importantly, however, the VS preamps onboard provide high-quality conversion at up to 24-bit/192kHz specification, meaning that Studio Capture isn't just a pretty face - it packs serious levels of punch in all the most important ways.